Happy Birthday to my lovely daughter!!! Born and raised in the Bay, Gee now runs the street of New York City in search of the flyest kicks and vintage. A graduate of New York University, Gee has worked in various capacities of the film industry, and now works as one third of the media production company Revery Media. Focusing on music video and commercial production, Gee recently started the company with two friends and works as the executive producer-- they have worked with Nola Darling, Nina Sky, Shinobi Ninja, Jade, Pocketknife, and Skotch Davis, and hope to work with more artists and musicians in the future. Beyond Revery Media, she was also recently named Senior Video Producer for M.I.S.S., she is excited to bring innovative and inspiring video content to all the viewers out there. She is a big fan of music, Mexican food, cupcakes and enjoying everything New York has to offer. Gee is a bit of a shop-aholic and loves vintage for sure. She has been wearing skinny jeans since sophomore year of high school and has a serious collection of t-shirts and sneakers. Gee is a big lover of music; rock, 90's rap, and yes she does illegal downloads too, but don't try to judge her. A late night owl with her BBerry, and BBMing she lives to work or maybe work to live in NYC! When not in her stilettos, you can find her rushing to the subway in sneakers with a cup of Joe! Well done Gee - keeping going for that Gold Star. Hi Lin, your daughter looks like a movie star. I commend her for her continued success and I ask God's blessing on her future endeavors. 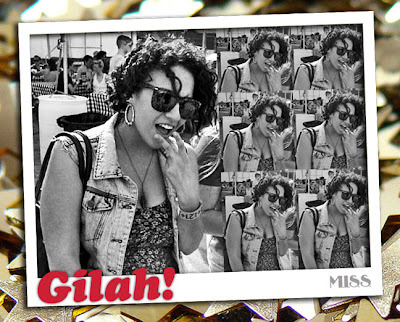 As a producer, when she Gilah is nominated for the Emmy's I look forward to a ticket to witness her getting her awards.